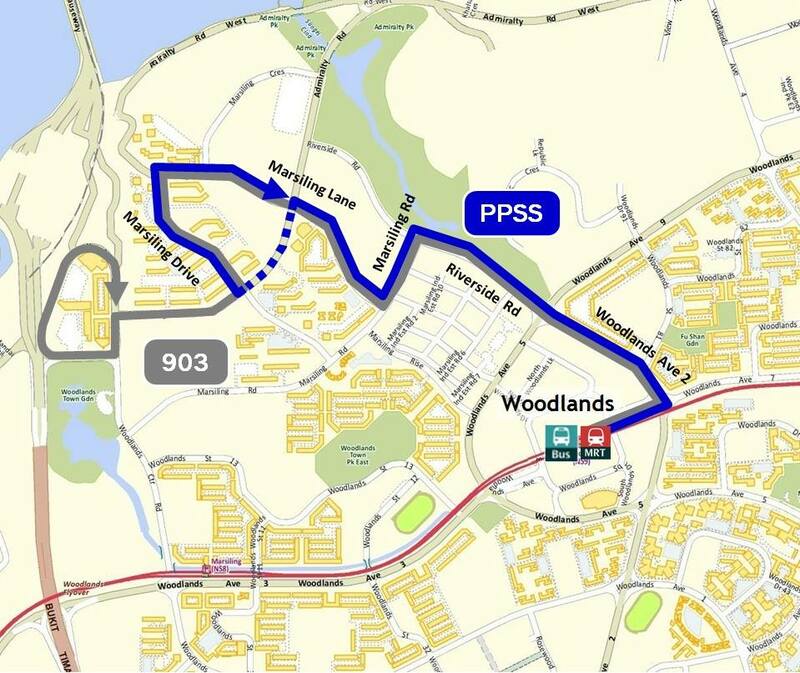 Peak Period Short Service 903P was a PPSS bus route from Woodlands Temporary Bus Interchange and looping at Marsling Lane, passing through Woodlands Avenue 2, Riverside Rd, Marsling Rd and Marsling Dr. Operating during weekday peak hours, it ran alongside Feeder Service 903 and alleviated crowding on high-demand sectors during peak hours. Peak Period Short Service 903P was withdrawn on 13 Jan 2017. New SMRT Bus Service 903M was introduced to replace this service on the same day. Service 903P duplicates the bulk of Bus Service 903‘s route, serving between Woodlands MRT / Bus Interchange and Marsling Lane. 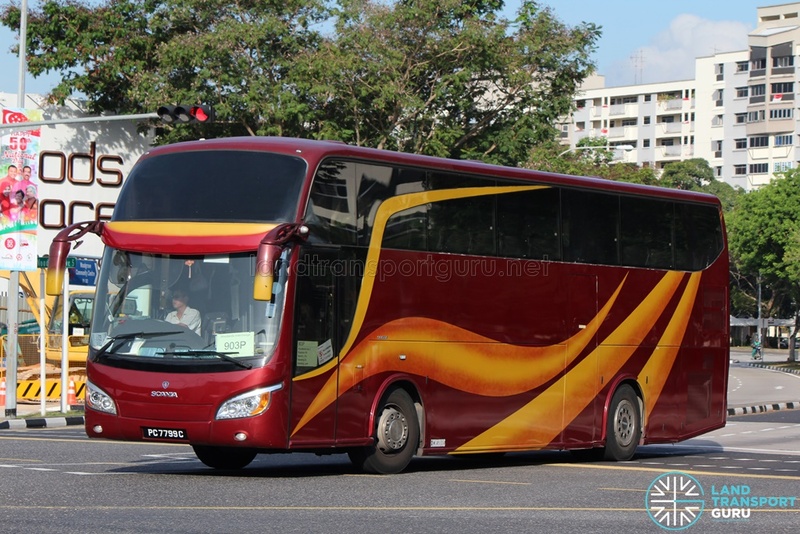 Operated using private buses from Rui Feng Chartered Pte Ltd, the route helps to relieve frequent overcrowding on Service 903. It does not serve Woodlands Train Checkpoint. It is the 12th PPSS service to be introduced, commencing operations on Tuesday, 13 January 2015. 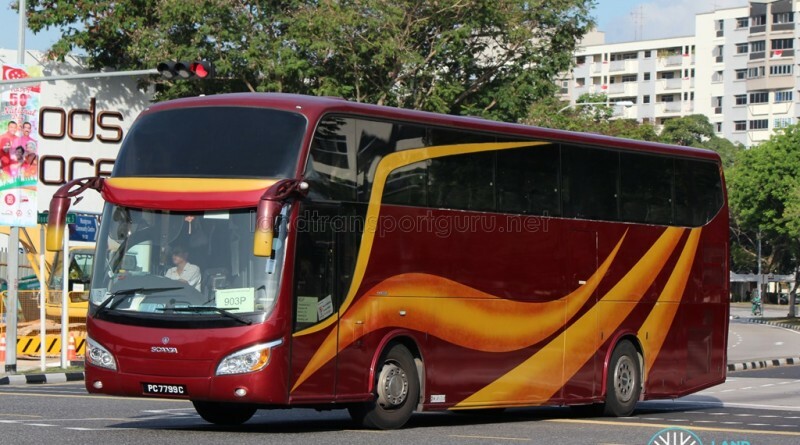 With the transition to the Bus Contracting Model (GCM), PPSS 903P will be renumbered as SMRT Bus Service 903M from 13 Jan 2017. 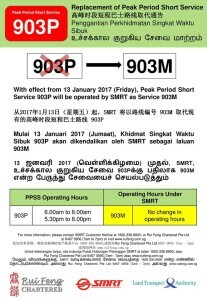 The last day of operations for 903P will be on 12 Jan 2017. More information at Changes to PPSS. 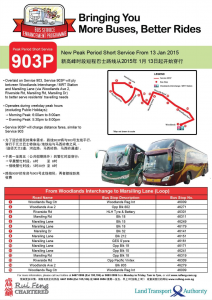 Fleet: Service 903P′s fleet fully comprises private buses from Rui Feng Chartered Pte Ltd.
2015 (13 Jan): Introduced as a PPSS route from Woodlands Int and looping at Marsling Lane under the BSEP. 2017 (13 Jan): Route withdrawn and replaced by Bus Service 903M.